Why Choose Investment Options (Aust)? Kerri has successfully completed the Diploma of Financial Planning and is an integral part of the Investment Options (Aust) team in her engagement as Personal Assistant to Frank Santagada CFP® Dip FP AFB C.Dec. Kerri carries the responsibility of data collation and maintenance; implementation of investment strategies to completion; and general workflow within the practice. 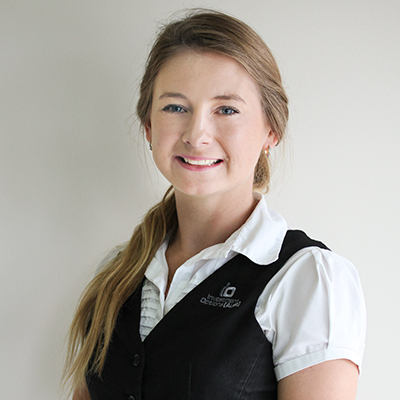 Currently, Kerri is completing a Bachelor of Business, majoring in Banking and Finance at James Cook University and her impressive resume showcases over 3 years customer service in the retail industry; followed by a period in the legal industry whereby she was involved in property settlements and conveyancing. Her experience has proven invaluable in assisting our valued clients with their investment and superannuation portfolios. Additionally, her in-depth knowledge on property settlements has assisted our clients with the sale and purchase of homes and investment properties. Her innate organizational skills and articulate nature have ensured the integrity of Investment Options (Aust)’s work ethics since 2013. Kerri is committed to client satisfaction through effective execution of internal operations and procedures. Frank Santagada CFP® Dip FP AFB C.Dec. Authorised Representative (ASIC 246139) of Securitor Financial Group Ltd ABN 48 009 189 495 Australian Financial Services Licensee 240687. Tower 2, International Towers Sydney, 200 Barangaroo Avenue Barangaroo NSW 2000. PO Box 5265 Sydney NSW 2001. All of a sudden we have something to look forward to in the future. Without your advice and support we would never have had the secure feeling about our financial future that we have today.